Boy has always been relegated to the outskirts of his small village. With a hump on his back, a mysterious past, and a tendency to talk to animals, he is often mocked by others in his town—until the arrival of a shadowy pilgrim named Secondus. Impressed with Boy’s climbing and jumping abilities, Secondus engages Boy as his servant, pulling him into an action-packed and suspenseful expedition across Europe to gather seven precious relics of Saint Peter. Boy quickly realizes this journey is not an innocent one. They are stealing the relics and accumulating dangerous enemies in the process. But Boy is determined to see this pilgrimage through until the end—for what if St. Peter has the power to make him the same as the other boys? 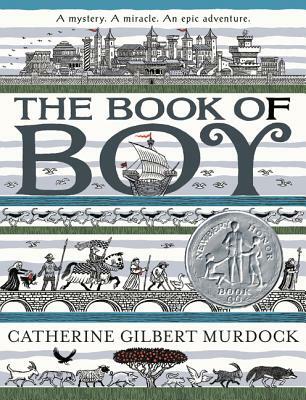 This epic and engrossing quest story by Newbery Honor author Catherine Gilbert Murdock is for fans of Adam Gidwitz’s The Inquisitor’s Tale and Grace Lin’s Where the Mountain Meets the Moon, and for readers of all ages. Features a map and black-and-white art by Ian Schoenherr throughout.